Stained Glass Panels of a few square feet (for example, a rectangle about 12” x 36” or 24″ x 24″ or a round panel up to 30″ diameter) may be shipped across the country without fear of breakage if you follow these guidelines. Always double-box. Think in terms of basic physics. Assume that any piece of freight has a one-in-four chance of being dropped or mishandled somewhere along the way. Use a rigid inner package. This is to support your panel against G-forces and whiplash-type effects if the whole box gets dropped. It’s also to prevent pressure from the outside from getting to your panel if the outer box gets crushed or punctured. In our shop we do this various ways. The simplest is to wrap the panel snugly in a number of layers of corrugated cardboard and tape it up well. Another way is to cut two pieces of thin plywood or rigid foam insulating board and wrap the panel in them. We use a sheet of bubble-wrap between the plywood and the glass. 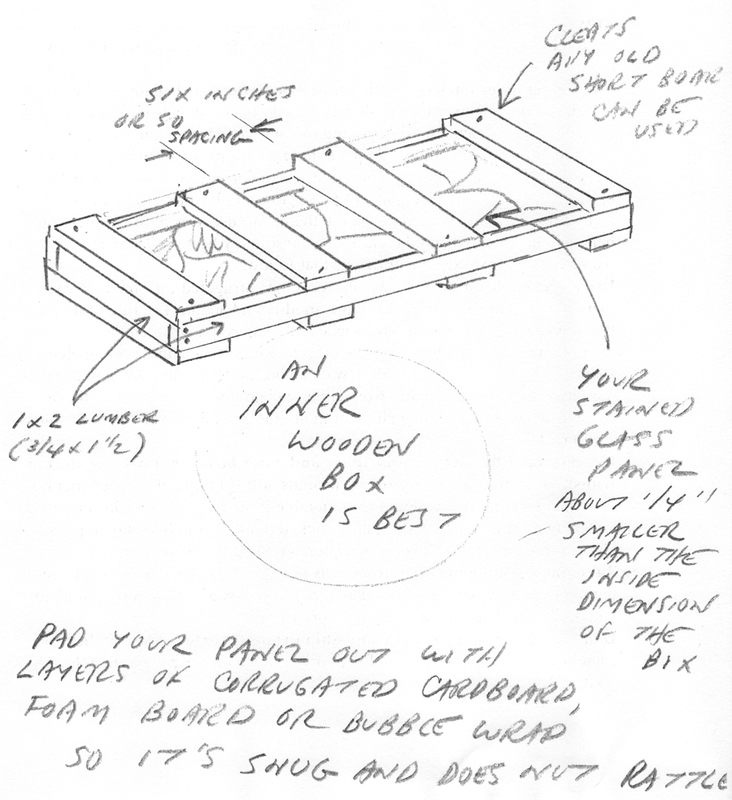 The absolute best way is to make a wooden inner box. See the drawings that follow. Use a crushable outer box. We use recycled corrugated cartons if we can find them in the right shape. We scrounge, modify and adapt. The rule of thumb is that there should be at least three inches of crush-room between the inner and the outer boxes. Sometimes we use bicycle boxes if the panel is elongated in shape. U-haul truck centers sell new clean boxes. A useful trick is to use two identical cartons slid together from either end around your inner box like a capsule, and then taped up well. Hot-melt glue guns work very well for joining cardboard. Use packing filler between the inner and outer boxes that will not shift in transit. It matters a lot. Styrofoam peanuts will shift and allow the inner box to settle to the bottom, where it is vulnerable if the package gets dropped. Use crushed newspapers, shredded paper packed tightly enough to stay in place, hay or straw or shredded wood excelsior, anything but foam peanuts! Take photos of the packing process as you go. You’ll probably never need them, but in the event of loss or damage, you will want to support your claim with evidence that you packed your work right. Don’t use a commercial pack-and-ship drop-off center. Most of them are franchise operations which employ poorly-trained or inexperienced help. Do it yourself! Use FedEx Ground Service when possible. It’s much less expensive than UPS or the U.S. Postal Service. Most packages take less than a week to get to from coast to coast, or at most two days to nearby states. No matter what shipper you use, make sure you understand the insurance. You should neither overstate nor understate the value, because in the event of loss or damage, you will be asked to justify that value. It will help a lot if you have paperwork or invoices to your client, and photos.